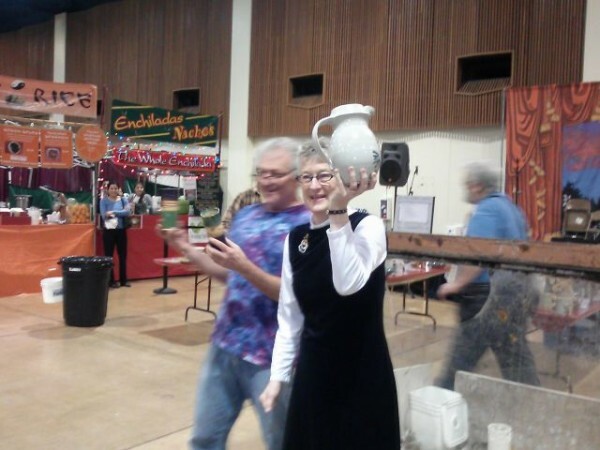 I've never successfully photographed the first pitch of the annual Pottery Smash. But this time, I got close. 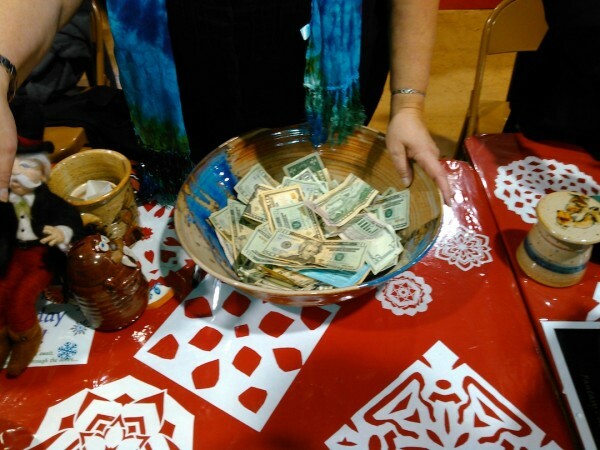 The 2017 Pot Smash and Benefit Auction for Saturday Market's Kareng Fund was this morning, and, as usual, was a smashing success. About a dozen potters, along with a jeweler, the Albacore lady and a maker of glass "bubble pipes" contributed seconds, over-stock, and frankly, just breakables to the event. We changed the start time this year, going a half hour earlier. Didn't change the amount of time the event took, about an hour, but it gave us an extra half hour to sweep up the shards and get ready for the public opening of Market at 10. This is a members-only event--food and craft vendors, Market staff, security and alumni, the occasional fairgrounds employee. Partly to give each other first crack at bargains, partly to not undercut ourselves with our paying public. I, for one, hate selling seconds in the same marketplace where I try to sell firsts. That said, it's a worthy cause. 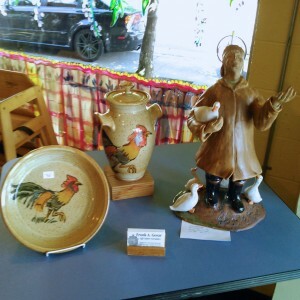 The Kareng Fund is Market's Artist's Emergency Fund, recently incorporated as a non-profit serving artists throughout Oregon. 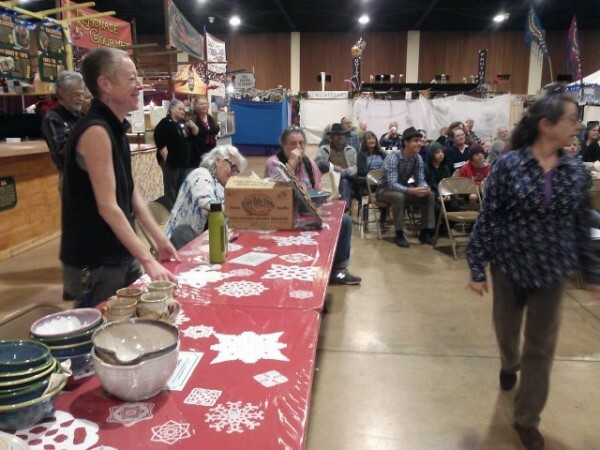 They've given over $45,000 in small grants over the past decade, and a big part of their funding comes from this auction and associated raffle. We had a very successful auction--roughly $3400 raised. Alex and Jon and I were kept busy making up auction lots and calling bids, with help from Claire in Vanna-ing the work. 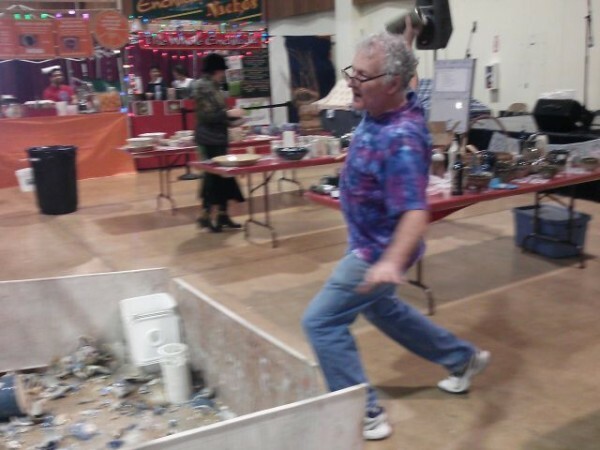 We closed up at 9:30, swept the few unsold small bits into a box for Art Bingo prizes and January, and swept the shards up into boxes for prospective mosaic art. 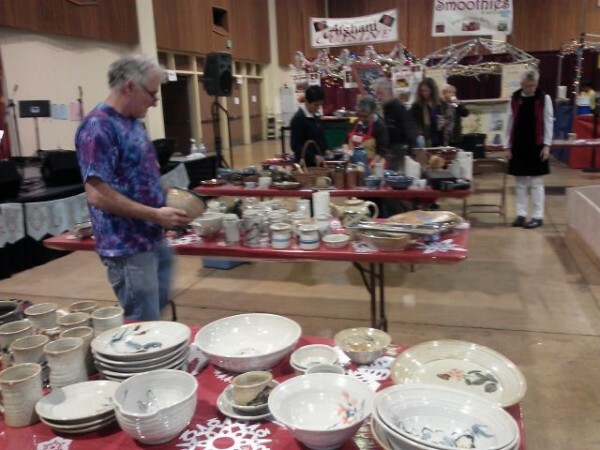 Food for Lane County's Empty Bowls Sale is tomorrow, from 4-8 pm at Sam Bond's Brewing, 540 E. 8th Avenue, in Eugene. 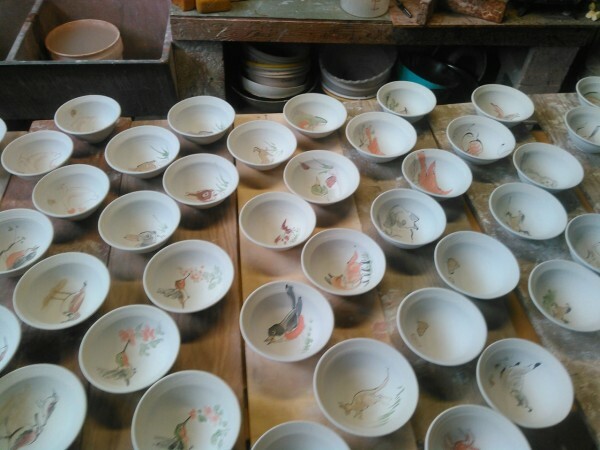 Over 1000 hand-crafted pottery, glass and wooden bowls will be available for purchase, and Bonds will donate $1 per pint sold to the food bank. 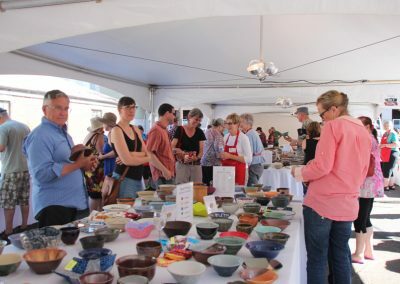 Getting ready for this year's Pottery Smash, a fundraiser for Saturday Market's Kareng Fund, emergency relief assistance for craftspeople in need. It seems like we have fewer items, or we do a better job of auctioning them (and occasionally smashing them. Seeing Alex take a hatchet to his painting was... memorable). We're done with 10 minutes to spare, but still raise a respectable $3000. So actually, this is the only picture I have from last night's ArtWalk, posing with volunteer Renee and and oddly familiar piece of pottery. Once they opened the doors, we were all just too busy. 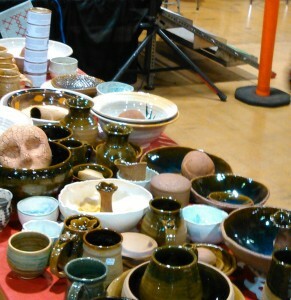 Talked to a lot of people who've been buying my bowls over the years, showed off some brushwork, even sold a few pieces out of my display. Had a nice talk with Mayor Piercy and a pretty sizable turn-out with the ArtWalk. Came home, stumbled through a late supper, and crashed hard. Woke later than usual (6:30 am rather than 5:30), scrambled to get down to Saturday Market for another working day. Fame is fleeting. 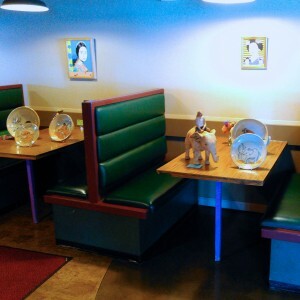 Getting ready for the ArtWalk tonight, I stop in at Food for Lane County's Dining Room. I'm setting up indoors, taking over some booths (the only place where the lighting is at all reliable) and the front server's table for my work. Still not quite sure what to expect, though I fear that, with the exception of the scheduled ArtWalk stop, I may be totally overlooked in the rush to get the best bowls. Actually, I'm probably okay with that. Meanwhile, out in the parking lot, they're preparing for the main event. 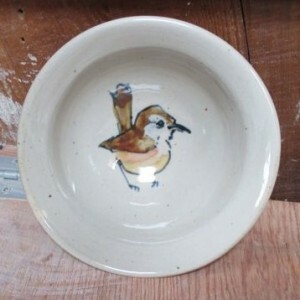 Dawn Marie tells me they have somewhere around 1,040 bowls this year, so my contribution is almost 10%. 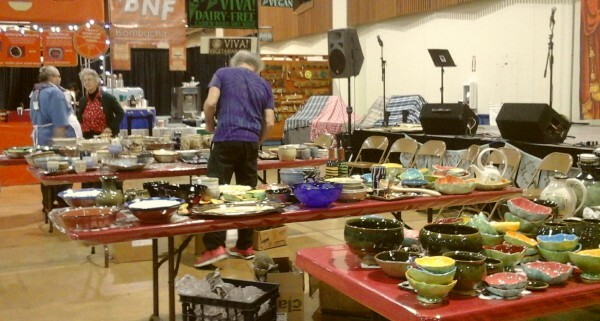 She introduces me to the volunteers sorting and pricing pots, and I get a nice round of applause. This Friday, I get to be in the spotlight for a little bit. 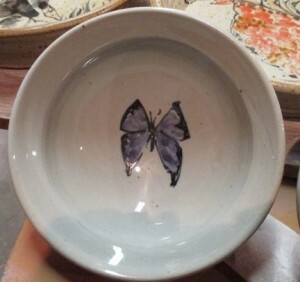 I've been involved with Empty Bowls for years now, basically since Local Clay took it over from OPUS 5 gallery, somewhere in the 1990's. 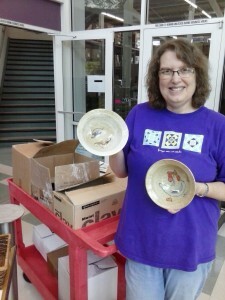 I've been EB vice-chair, then chair for Local Clay, organized our first "Throw-a-thon" at Club Mud, and try to give them at least 100 bowls every year. This year I think it was 106. 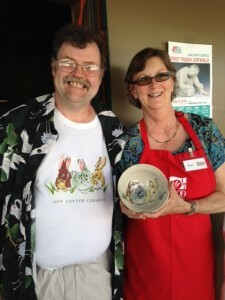 I've written elsewhere about why Empty Bowls is so important to me. This year, they're showing that I'm important to them as well. This year's sale is on the first Friday of the month, and so they're participating in Lane Arts Council's First Friday ArtWalk. They're the final stop on the tour, and have asked me to be Featured Artist. I'll have a display of my non-bowl work (including a couple of sculptures), bring along some hand-made brushes and demo paper (don't think I'm quite up to actually glazing pots), and figure out something clever to say to the guest tour-leader. 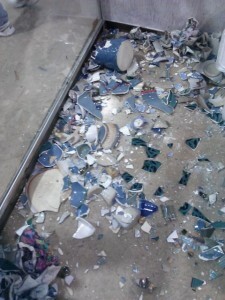 (aka Pottery Smash) happened yesterday morning before opening. 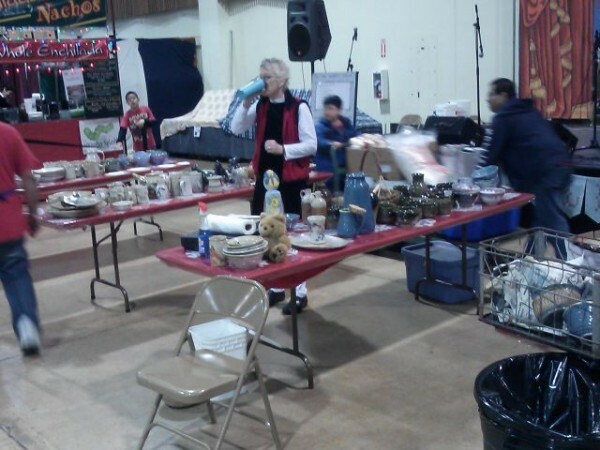 More than 20 vendors donated ware, lots of pottery, but also glass, mosaic, t-shirts, needle felt, canned albacore tuna, cameos and catnip mice. 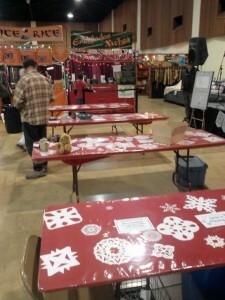 Turnout was a little smaller than previous years, but we still raised nearly $3000 for the Kareng Fund, our emergency relief fund for distressed crafters. We also broke a lot of bad pottery, shards of which were carted away to make mosaics at a birthing center. Here's some scenes from a smash. As one of the three auctioneers, I was too busy to get any shots of the event itself, but Tara brought a proper camera, and promises me pictures; I'll post them when I receive them. 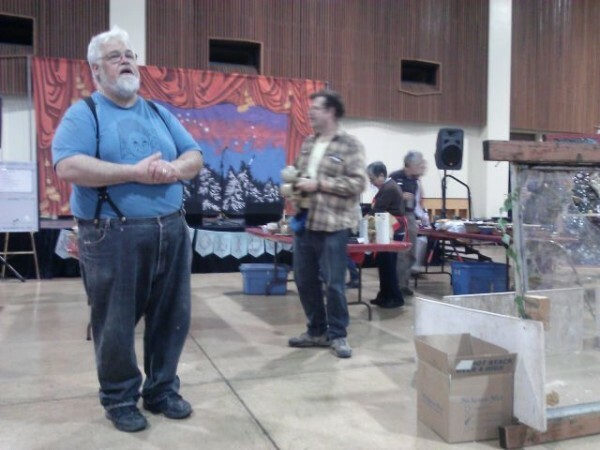 This is what a happy food bank fundraiser looks like. Meet Dawn Marie Woodward, Events coordinator for Food for Lane County. 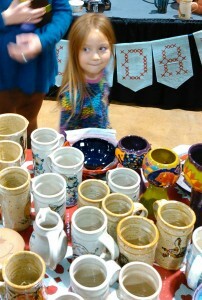 She's helping me unload and bring in 172 soup bowls for next Friday's Empty Bowls fundraiser. 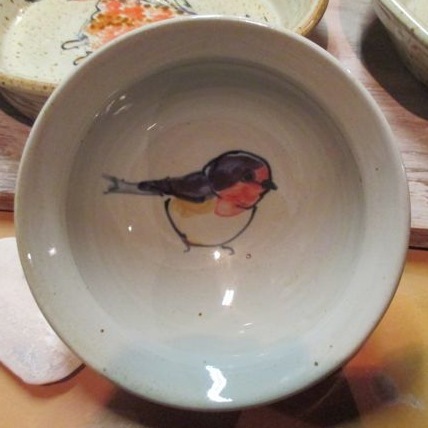 (I usually aim for a hundred bowls, but lost track sometime last winter…) I've written elsewhere about the reasons I contribute bowls; what I forgot to say is how much rewarding it is to have people excited, even delighted, to see my work. 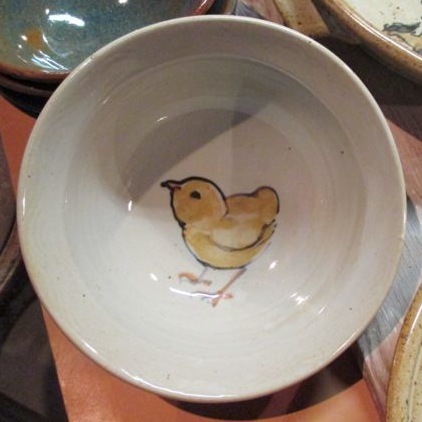 The original Empty Bowls was a student fundraiser in Michigan in 1990-91; since then the idea as spread nationwide, including over half a dozen different events in Oregon alone. 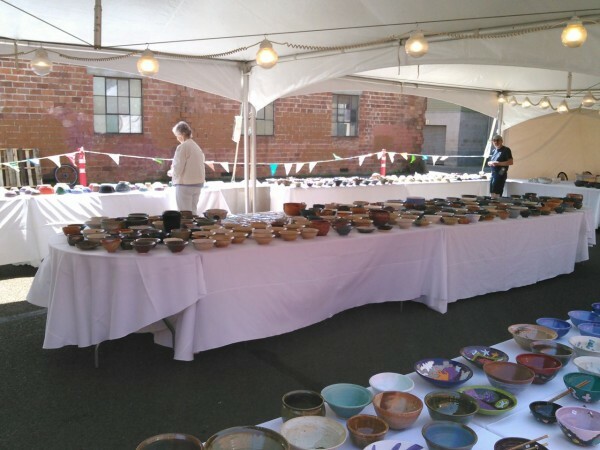 Eugene's Empty Bowls sale is an annual event, featuring bowls by local potters, wood and glass-workers, and the assistance of pottery organizations including Local Clay and Clayspace. Over 1000 bowls are sold with proceeds going to hunger relief in the local community. 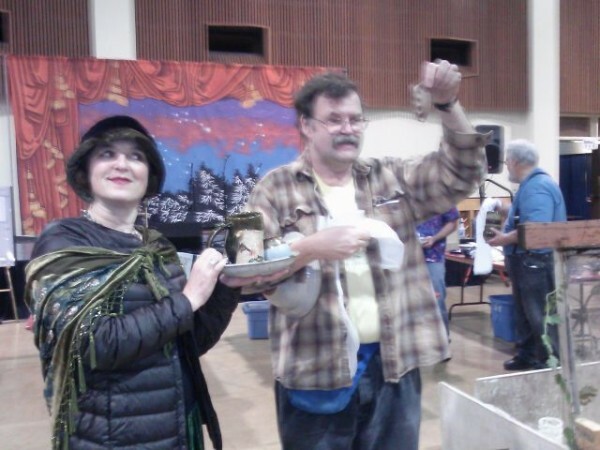 Moments captured from a Pottery Smash--er, Charity Auction with Percussive Interludes. Alex, Jon and I are auctioneers; Claire volunteered to "Vanna"--hold up auction items for us. Market assistant manager Kim also got drafted to help select auction combinations. Featured was a lot of pottery, baskets, canvas bags, some gorgeous woodwork. Also a couple of cases of albacore and chinook salmon, which we split up to offer such items as a tuna-casserole baking dish, complete with tuna. Jon throws out the first pot--too fast to photograph. Here, he repeats for the camera, in slow motion. Alex explains the rules, while I wait with my first auction item, a fistful of coffee mugs. Claire demonstrates the fine art of Vannaing as Jon gets the bidding started. The business end: Elise and Deborah take cash payment, while Market manager emeritus Bill runs the Square pad. 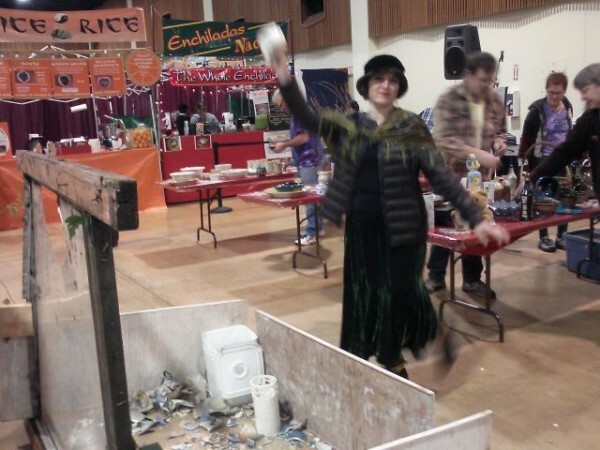 Market assistant manager and fashion goddess Kim shows how to smash pots stylishly. Jon cruises the stock tables, putting together his next auction package. Tiny treasures hide in the bottom of larger ones. In less than an hour, everything is gone. Some to the smash bin, far more to happy vendors, staff and friends of the Market. 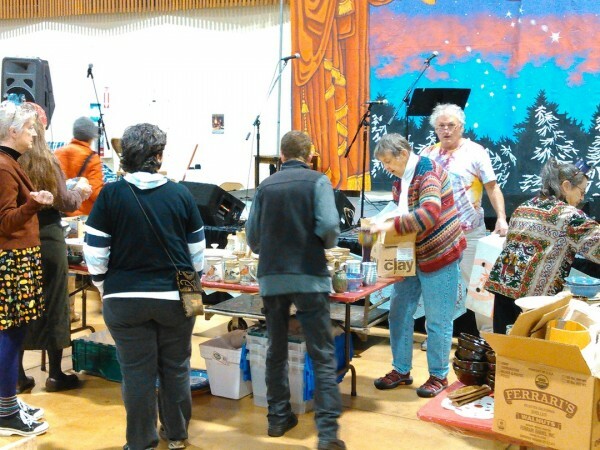 And we raised over $4200 for the Kareng Fund, Saturday Market's vendor emergency relief program.